As you guys know, I love my planner. My Kikki K comes everywhere with me and I like to use cute supplies - I find that it really cheers my day up when I'm planning fairly boring things. Pink Planner Girl is a gorgeous Etsy shop which sells lots of cute supplies including washi, stickers and pens. I got 2 rolls of cute washi - one with little hearts and one with arrows. I use washi tape a lot, be it in my planner or to stick up bunting or prints on my wall. This is such a cute way to use washi tape! The tape itself is of fab quality and the prints are precious. 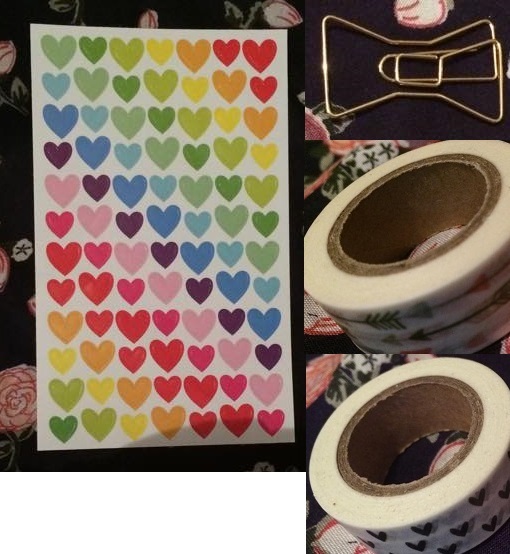 I also picked up 3 sheets of Nicola's rainbow heart planner stickers which are adorable. And of course, I had to get a Kate Spade bow paperclip. I've wanted one of these for ages and they are so reasonably priced on Pink Planner Girl! Finally, I got this Japanese pen with little panda bears on it. The nib is very fine and it writes in black ink. It's so adorable, I love the Japanese writing on there and it writes really well. It feels nice in my hand as well, which is always good! Check out Pink Planner Girl, her planner supplies are gorgeous and everything is fab quality.